For two weeks we have been babysitting a dog with a sweet name, Moonpie. Her owner, my good friend Lynette , left for a month to save the world ( Africa in particular), and brought the dog to us. 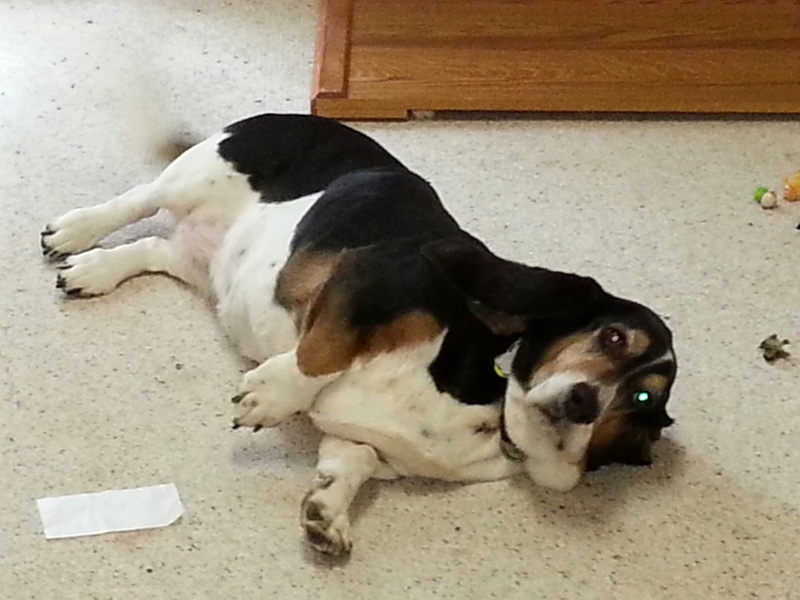 Moonpie, as you can see from the picture, is a Basset Hound and she looks like a hybrid of crocodile and cow with the cutest face. Lynette adopted Moonpie from a shelter when she was 3 years old. Doggie happens to have a past and some psychological problems. When she is nervous, she begins to eat books, especially the ones that you are now reading. She gets nervous quite often, almost always when left alone. My husband and son approached this habit with deep understanding…They both ( famous dog shrinks), explained to me that when Moonpie eats the book it’s probably the same as when kids bite nails. When Lynette brought the dog to us, she went around our house and advised that we move up some of the books. Aside from her neurosis, Moonpie is easy and sweet: she sleeps a lot and even snores. The only challenge is that she requires belly rubs constantly.. . For these two weeks we had several funny moments with the dog, but I want to share with my favorite one. It was my son’s Birthday and as a loving mother (of course) I baked him a chocolate cake (photo is provided)… Next day, we had to leave for two hours. Moonpie already charmed us to such an extent that we relaxed and began to quietly leave her alone in the house with books. As we were leaving, she was sadly looking at us out the window. When we came back, Moonpie lay down next to the entrance door, fondly glancing at us and waving her tail. I naturally rushed to her ​​to give her belly rubs because she looked so cute and impossible to resist . After that I continued into the living room. First I saw that she had heavily chewed a small cardboard box from among the presents. Well, at least she didn’t touch the present-it was okay . I continued to the kitchen , suspecting nothing else . 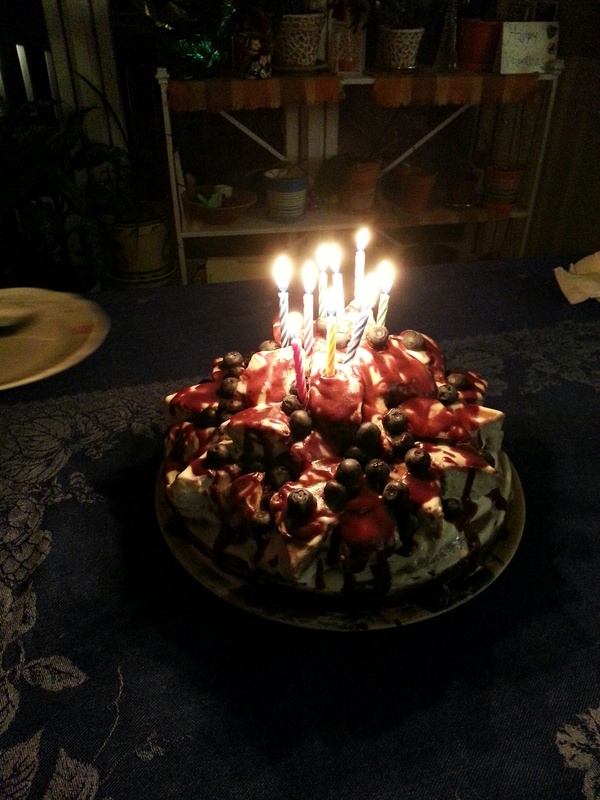 On the counter was the beautiful birthday cake, a napkin lying next to it…. and a quarter of the cake eaten in some kinda terrible way…. The first thought that it was my husband … (Husband is always guilty for everything –right?). Then comes the realization that even if my husband loves sweets, he is still able to control himself to not eat it like that without a knife and a plate. I started looking for the dog to look at her eyes.. I couldn’t believe she was able to reach the countertop with her little short legs … Moonpie hid behind the sofa and peeked out looking ashamed, or it probably seemed to me that she looked ashamed. In any case, it’s clear that the dog has a sweet tooth, which is in line with her name. P.S. Pictures attached: 1. The Cake before. 2. The dog after. Posted on March 17, 2014 October 23, 2014 by YuliaPosted in Laughter with a Foreign Language, Moving to a different countryTagged Dogs, funny, Mystery.